Contains natural ingredients: Vitamin C, gotu kola, green tea extract, glycolic and salicylic acids. Blemishes!! They seem to appear out of nowhere. 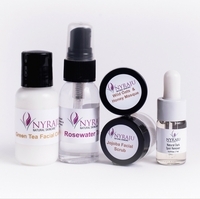 Before you try scrubbing your face with an abrasive exfoliant, give your skin the healing power of NYRAJU Skin Care's Vitamin C Serum for Acne. It's our emergency blemish treatment, that's packed with antioxidants and works right away to clear up blemishes on your beautiful black skin. Use the proven powers of natural ingredients like green tea extract, Vitamin C, and centella (gotu kola) to deep-clean your pores and erase the blemishes. How To Use: Morning and night ... One Squirt into the palm of your hand. Apply it to your acne challenged skin. Ingredients: Vitamin C, gotu kola, green tea extract, glycolic and salicylic acids. Your Vitamin C Serum has helped with my adult acne. I thought I'd had all the breakouts I was going to get but hormones can be challenging to your skin. The serum helped control the oiliness and inflammation because of the acne. My skin feels and looks great! I had a hard time spending $40 on products for my teenager especially since she tries products and them tosses them in the drawer. Your Vitamin C serum gave her relief from the breakouts and is helping her with her confidence in the way she looks.